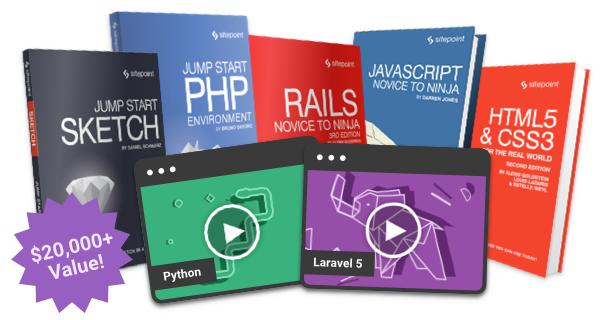 Over $20,000 worth of SitePoint web development and design books and courses for $99. Today, get two years of SitePoint Premium, for the price of 1 – save 50%! Stay ahead of the game, and learn techniques to build better, faster, and more responsive websites and apps. …plus access to every book and course we release in 2017 and 2018! Buy now and save $99! Did we mention priority access to everything we release in 2017 and 2018? All our stuff, yours to download, for just $99. Grab this deal before it’s gone! EndsÂ midnight Cyber Monday.